Nuns and Sisters– This is a big category for girl saints! I have directions posted here for putting together a simple no-sew nun costume. There are so many great saints to choose from! Mother Teresa– find directions for putting together a super easy, no-sew Mother Teresa costume here using blue painter’s tape for the stripes! Saint Rita– Classic black robes. Saint Clare of Assisi– Carry a monstrance. You can shape a simple monstrance from aluminum foil or find a monstrance craft here. Saint Teresa of Avila– Carmelite order, brown robes. Doctor of the church, so carry a book and a feather. Saint Scholastica– Carry a crucifix. Saint Faustina– Carry a picture of the Divine Mercy image. Also, she had stigmata. Saint Katherine Drexel– Wear a big crucifix necklace. Saint Margaret Mary– Carry a picture of the Sacred Heart of Jesus. Saint. Catherine of Bologna– Patroness of artists. Saint Marguerite– Her order wore fabric tied around their heads in white and black. Saint Therese of Lisieux– Carmelite order, brown robes. Carry roses and a crucifix. St. Elizabeth of Hungary– Carry a basket with some bread and roses. St. Ursula– Daughter of a Christian British King. St. Cloitilde– Daughter of King Chilperic of Burgundy. St. Isabella of Portugal– Queen of Portugal. St. Margaret– Queen of Scotland. St. Brigid of Ireland– Scottish Princess. Craft a St. Brigid’s cross to carry with you. St. Helena– Carry a cross. St. Agnes of Prague– Daughter of King of Bohemia and Constance of Hungary. St. Olga of Kiev– First Christian Queen of Ukraine. St. Dymphia– Carry a sword. St. Audrey– English Princess. Carry a sunflower, which is her symbol. St. Adelaide– Princess of Burgandy. 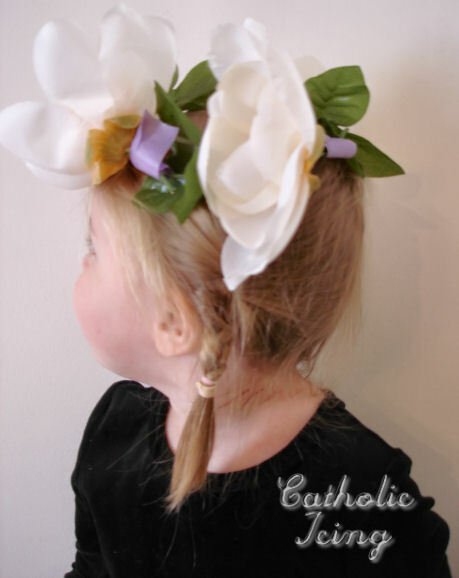 Flower Crown- You don’t have to dress up as a queen or a princess to have fun with a crown on All Saints Day. Find some ideas for making your own floral crown here. St. Cecilia– She was crowned with roses and lilies by angels. If you dress up as St. Cecilia, be sure and carry an instrument! St. Rose of Lima– She is often depicted with a crown made of roses. St. Lucy– Also known as St. Lucia. She wore a green wreath on her head with candles all around it. This crown g ets paired with a white dress and a red ribbon tied around the waist. Read more about putting together a St. Lucy costume here. St. Philomena– She wears flowers as a crown, and you can carry an anchor. 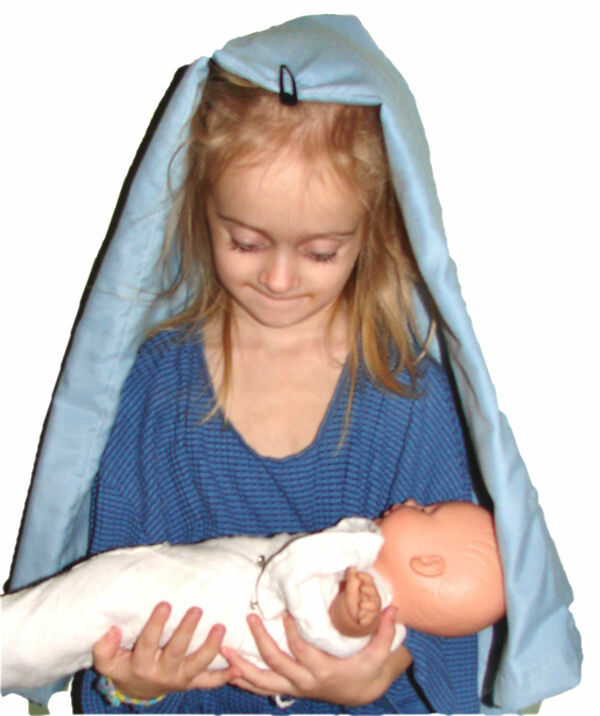 See a St. Philomena costume with directions here. Mary– Our Lady is often crowned with flowers, and she’s the queen of all the saints! Doctor– St. Gianna Beretta Molla. She was a modern doctor. Where a white lab coat, and carry a baby doll (or a little baby sibling). Soldier– St. Joan of Arc. Girl dressed in armor. Simple armor can be made from cardboard, duct tape, and aluminum foil. Armor can also be found at the Dollar Tree around Halloween time. Maid– St. Zita. Wear a simple dress, an apron, and a handkerchief in your hair. Carry a broom or a duster. Can also carry bread or roses in your apron. Our Lady of Guadalupe– Wear a pink dress with a black ribbon tied around the waist. This is a symbol of pregnancy. Then you need a long blue veil with golden stars on it. You could paint them on with gold glitter glue, or use gold foil star stickers. This is a great costume to pair with San Juan Diego! Our Lady of Fatima– Also known as Our Lady of the Rosary. Dress in a white gown with a white veil trimmed in gold with a crown placed on top. Carry a rosary. Immaculate Heart of Mary– Dress in a red dress with a white veil and a blue sash or cape. Tape a picture of the Immaculate Heart on your chest. Or, find directions on tie dying an Immaculate Heart shirt. Our Lady of Lourdes– Also known as Our Lady of the Immaculate Conception. Wear a white dress or robe, and a white veil. would be a great costume to pair with St. Bernadette! Angel– Dressing up like an angel for All Saints Day can be great fun! You’ll need a white dress, a halo, some wings, and possibly a harp. I have directions for making angel wings here, and a diy for an angel tutu here. A harp can be easily cut from cardboard, then use pipe cleaners for the strings. I also thought these angel wings made from paper plates were pretty clever. I absolutely love this feathery angel costume! Saint Josephine Bakhita– She wears a really fun bonnet! Check out this great St. Josephine Bakhita costume complete with directions for making the bonnet. 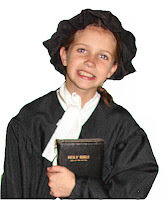 Saint Elizabeth Ann Seton– She wore a black, floppy bonnet. Blessed Anne Marie Taigi– She wears a white, ruffly bonnet. St. Bernadette– The Blessed Mother appeared to her 17 times. Fatima children- Blessed Lucia, and Blessed Jacinta. Native American– Blessed Kateri Tekakwitha. Dress as a Native American girl and carry a cross made from 2 sticks tied together. Find my directions for making a St. Kateri costume here. You can also make this easy paper bag version at the last minute. Also, I think this Indian costume is the cutest!!! First Communicants- Maybe you have an old First Communion or Flower Girl dress lying around the house? There were many Saints who had a devotion to making their First Communion. 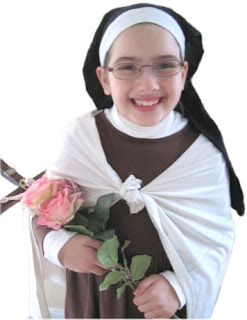 Dress up like a First Communicant in a white dress and veil. St. Therese- read about her First Communion here. Saint Agnes– Carry a stuffed lamb. Saint Veronica– Carry a veil with Jesus’ face on it. Find directions to craft your own Veronica’s veil here. Saint Genevive– Carry a candle. Saint Mary Magdelene– Wear a long wig and carry a bottle of perfume. Saint Lydia– Carry purple cloth. Saint Dorothy– Carry a basket of roses and apples. Saint Martha– Carry a broom. Saint Elizabeth– Stuff your robes into a pregnant belly (baby St. John the Baptist). I also have a post here about dressing up girl costumes with tutus to make them more fun! Thanks to everyone who submitted pictures for this post, especially Gretchen, Elizabeth, and The Cotter Family. If you have more ideas for girl saint costumes and would like to share, please comment below. If you log in and comment, you can actually add an image to share a picture of your little saints with all of us, or leave a link to a post on your blog. Now Check out my Saint Costume Ideas for Boys! Hi! Nothing shows when I got to this page? Do you have the information elsewhere? Umm…. WHERE IS THIS POST?! I’m about to freak out because it took forever to write! What in the world?! Well, I will find it. So weird. 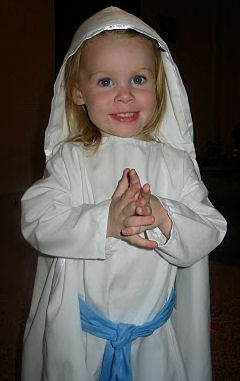 I am not Catholic, Pentecostal actually, but this is such a cute website! Props to whoever set it up!! Hi! I love this information and plan on distributing ideas to parents for our Church’s All Saints Day Celebration. Would you be willing to repost the boys costumes? The link seems to be deactivated. Thank you so much for this list, and the boys’ list. I started to freak out a little yesterday when my son came home from CCD with info on his All Saints party and I realized I was going to have to come up with three saint costumes for the kids. So glad I looked here first!!! Thanks! 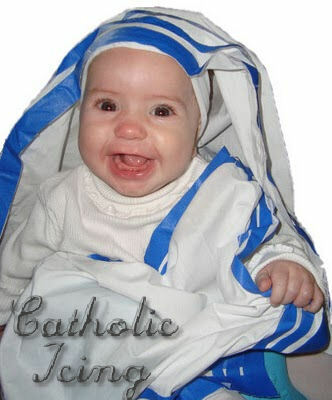 I noticed that the link to the new-sew Mother Theresa costume doesn’t seem to be working. I’d love to see the pattern for that if you have another link. Thanks for putting this all together! Thank you for the great list and ideas! My daughter has been asking me if any saints were princesses so this is also a great resource for us! adding to my comment above, also keep an eye out for any “ethnic” looking costumes…these can often be turned into a costume of a saint from that country. I bought a Mulan costume one year that became a costume for a young Japanese girl that was martyred…don’t remember her name off the top of my head. Period costumes work too…something colonial-ish looking works for St. Elizabeth Ann Seton, something Renaissance-ish works for Saints that lived during that period, etc…. This is an AWESOME list, Lacy! I’m sure it took some time to create! BTW: Thanks for linking to me! God Bless! I love your web site! Great ideas! Thank you so much. I teach kindergarten at a catholic school and you are so inspiring. The Holy Spirit is working through you. These are so cute! 🙂 I’d also recommend St Gemma http://www.catholic.org/saints/saint.php?saint_id=225 and St Catherine of Siena http://www.catholic.org/saints/saint.php?saint_id=9 for St Catherine you can dress as a Dominican (back then the tertiaries wore habits too) and carry a book and a lily like in the picture… for St Gemma, put your hair in a low ponytail, and wear a black dress with a shorter cape, and if you want to, a black straw hat 🙂 She also had the stigmata. These are two more awesome Saints! I was wondering if anyone has any experience with schools/churches opposing the idea of an All Saints Day party because it somehow takes away from the “holiness” of the Holy Day. Would appreciate any thoughts or arguments. Never heard of this before. Sounds like someone who maybe doesn’t understand children? Do you think 16is too old to be St Kateri? Hello! As usual, you are such a blessing to all us catholic moms with all your great ideas! Thanks! I wanted to ask your permission to link to your website’s All Saint’s costume ideas (boys and girls) from my small parish website. We are having our very first All Saint’s Day party this year (hopefully to become annual) and it would be nice to have some easy and great costume ideas for parents. We plan to use many of your ideas here also! Thanks so much again!! Wow! These ideas can really help me prepare for our school’s ‘Parade of Saints’! Thank you!! Do you girls dress up on all saints day??? This post is such a great resource! My daughter is doing her first Parade of Saints and this has been so helpful! Thanks!